Okay, so it's not that warm yet but its feels like grilling weather to me. Springtime = spring cleaning. I don't know about you, but we have a lot of outdoor cleanup to do in the spring. If I didn't call 'quitin' time' we would work from sun up to sun down. The only way I can talk Paul into stopping is telling him that we should have people over and grill out. Who can resist that fun -- besides, you know what they say about all work and no fun?! I hope everyone can find a way to embrace their spring clean. Make sure to set some time aside to bring out the grill, kick back and relax with your friends and family ... and maybe a Mediterranean Tofu Steak! Marinade the tofu for atleast 3 hours, mixing around every now and again to make sure it is all nicely seasoned. 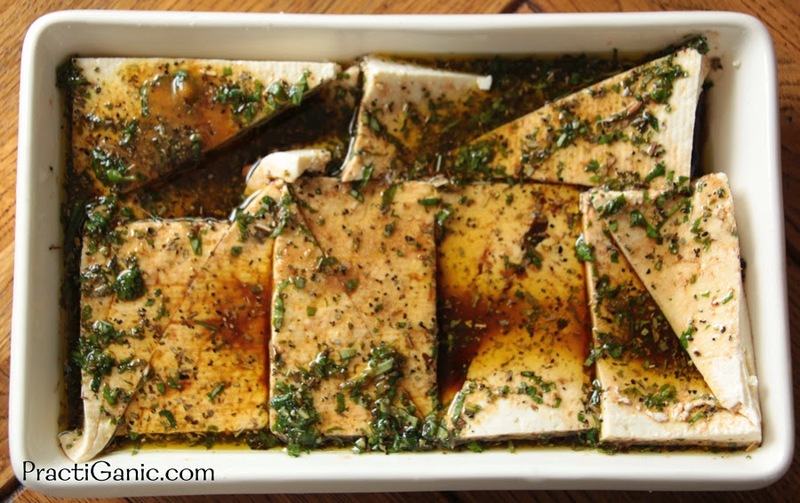 When ready pull out the tofu, reserving the marinade and putting the sun dried tomatoes, olives and feta in it. Set aside. Heat up your grill, works indoors on a grill top or outdoors. Place the tofu on the grill and cook for about 4-6 minutes on each side depending on how firm you like them. Make a bed of spinach on each plate. Top spinach with grilled tofu and then tomatoes, olives and feta.